Photo of the new Isakson Living plan from October 2014. Roswell Road is at the bottom of the page, and East Cobb Park is to the right next to Sewell Mill Creek. 84 single family homes that would be owned by the homeowner not Isakson Living. However, according to IL, all homes and apartment units would still have membership monthly fees as in a CCRC. 84 Homes would be priced at around $600,000 and be 2-story and 3-story tall. All living units (houses and apartments) would be available to anyone 55+, and children would be allowed. IL was undecided about if the 316 apartment units would be sold directly to the homeowner like a condo or if IL would own them with a buy in fee as was the case with their last proposal. Starting with a 3 to 4 year build out rather than 10 year plan as in earlier proposals. This plan cuts down more trees, mostly eliminating the tree buffer along the existing subdivisions. The 84 single family homes are built in a very dense fashion, much more dense than any of the adjacent or nearby subdivisions. The large buildings are still too tall. The CCRC zoning code allows for a maximum of 2 stories in Low Density Residential areas like the Tritt property. The Cobb County Commission can grant up to 4 stories if circumstances permit. The new plan calls for 3 stories over mostly exposed parking, which are effectively 4 stories. This plan does not fit in a low density residential area. Asked for density of the "subdivision" part of the plan but they said it was all part of the CCRC so they don't consider density. Note: According to current R-20 zoning between 80 to 90 homes could be built on the property. This current plan has 84 densely clustered homes plus 11 large buildings. Asked about the center of the property's commercial amenities as there is a long list of allowable retail uses in the CCRC code, but IL has not given us a listing of what retail services that are listed in the CCRC code they will provide at this location (there numerous allowable retail services listed in the CCRC code). This is what we understood from a meeting with Isakson Living, East Cobb Civic Association representatives and 2 Concerned Citizens, and these are our meeting notes. We have encouraged Isakson Living to present their plan to the community so that we can all understand the plans before the Board of Commissioners meeting on November 4 and November 18. We will update this page as we learn more about the details of the development. You can email the Board of Commissioners about your perspective here or at the end of this page. You can easily add your own words in the 'Your Comments' section below. When you click 'Send' the email will be automatically sent to the Zoning Planning Commission and the Board of Commissioners. 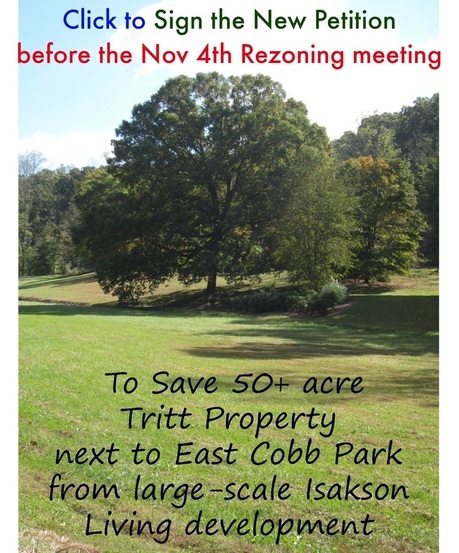 I urge you to vote -no- to the Isakson Living rezoning request for the Tritt property. 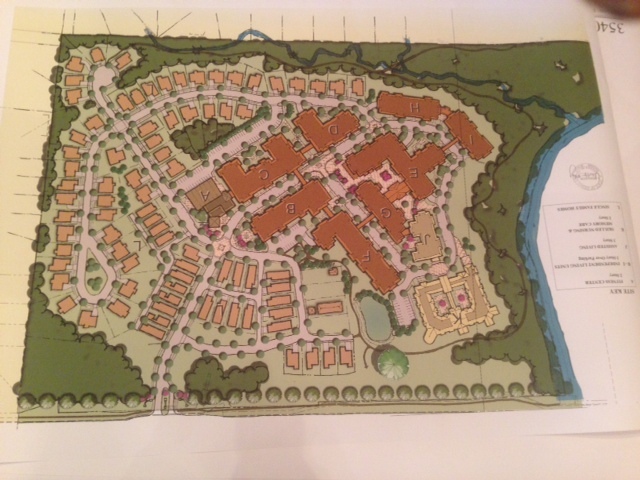 This proposed development is much too big for the East Cobb area.